■ MADAGASCAR: Air Madagascar signs MOU with Vanilla Islands Organization to further enhance regional connectivity. Following a recent ministerial summit held on the French island of La Réunion on September 10, Air Madagascar (MD) and the Vanilla Islands Organization (VIO) of the Indian Ocean have announced the signing of a Memorandum of Understanding (MOU) which aims to strengthen and liberalize air connectivity between member island states was signed by the Seychelles Minister for Tourism & Culture, Alain St. Ange, the sitting President of the VIO, and the CEO of Air Madagascar, Mr Hughes Ratsiferana. ► FLEET UPDATE BULLETIN: Air Burkina, Malu Aviation, Skyward Int'l, Jetlink Express, Air Madagascar, Ethiopian Airlines Cargo, Mango, Sahara African Aviation, SKA Aircraft Leasing. The following is a fleet update bulletin for aircraft that are in use, have been in use or will be in use for these listed airlines: Ethiopian Airlines Cargo, Mango, Sahara African Aviation, SKA Aircraft Leasing, Air Burkina, Malu Aviation, Skyward International Aviation, Jetlink Express, Air Madagascar. ■ EU BLACK LIST: Mozambique, Madagascar lay more blame on the "operating environment" as opposed to individual airline's safety shortcomings. Following the announcement by the European Commission on Wednesday on its updated Carrier Black List, Mozambique, Mauritania and Madagascar's press have responded to the news in varying ways, with the Mozambican press and Air Madagascar claiming that the Ban is not so much about their airline's respective safety records, but more about the general status quo of aviation and aviation safety in their countries. ■ BELGIUM: EU removes Mauritania from Ban List; adds all Eritrean registered carriers. Libya voluntarily retains restrictions on Libyan registered carriers. The European Commission has announced the 20th Revised Update to its Banned Operators Air List which has seen some "promotions" and "demotions" for African airlines as a whole. All operators from Mauritania have been removed from the Ban List. Air Madagascar (MD) is still only allowed to operate into the EU albeit under strict conditions (as per the previous No Fly List). All Rwandan carriers have been removed from the list. Libya has agreed to maintain the voluntary restrictions applicable to all air carriers licensed in Libya whilst an operating ban on all air carriers certified in Eritrea has been imposed. ■ MADAGASCAR: Air Madagascar passes IOSA, EASA audits; wants to be struck off the EU No-Fly Ban List. After a cabinet meeting which judged troubled national carrier, Air Madagascar (MD), to be on the path to recovery, the Madagascar government will, before the end of October, send an inter-ministerial delegation to Brussels to lobby for the removal of national carrier, Air Madagascar (MD), from the EU's No Fly Ban List. ► MADAGASCAR: Air Madagascar to ask for USD9million bailout as part of 18-month plan to return to profitability. After the ordinary and extraordinary general meetings of shareholders in the Malagasy capital Antananarivo on Thursday last week, Malagasy national carrier Air Madagascar (MD), has announced plans to pull the airline back from the brink of bankruptcy, and return it to profitability within an 18 month time frame. ► MADAGASCAR: Air Madagascar reduces Paris flights from October. 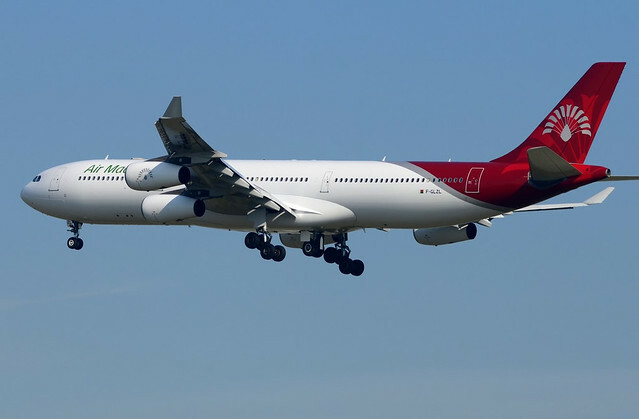 With effect from Winter 2012 (i.e 28 October 2012), Air Madagascar is to reduce its current Airbus A340 operated 4x weekly flights from Antananarivo, Madagascar to Paris CDG, France to 3x weekly. Its other French route, Antananarivo, Madagascar to Marseille, France, is to remain a once (1x) weekly service. ► MADAGASCAR: Air Madagascar announces Asia operational changes for Summer. 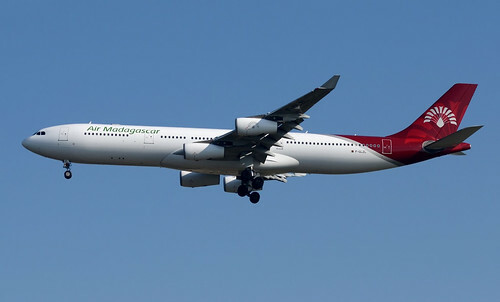 Air Madagascar (MD) has announced that it will introduce its Airbus A340-300 on its Asian routes for the duration of 5 July to 27 October 2012. Presently, the airline operates a Boeing 767-300ER on its Antananarivo – Bangkok – Guangzhou and Antananarivo – Bangkok routes. The Madagascan carrier signed a 6 year lease with Air France for two Airbus A340-300s in March of this year, with the option of buying the two aircraft when the lease expires. Previous attempts in May of last year to modernize the fleet with other Boeing 767s ran into a brick wall as the planes were added to the European Union's Banned Operator's List.